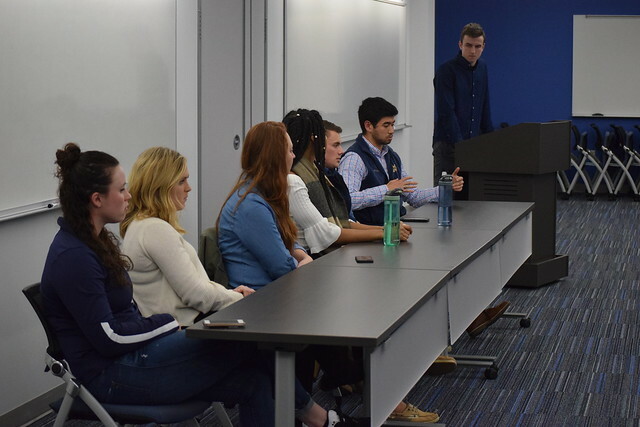 On April 11, students interested in learning more about the various career opportunities in the finance industry participated in a panel run by upperclassmen from various disciplines involved with SIBC and moderated by a first-year student. Andrew Meisenbacher ‘18, Economics and Chinese. Andrew will be working for Vanguard's Investment Management division. Danny Crooks ‘19, Finance and Political Science. Danny will be interning at J.P. Morgan this summer in the Wealth Management division. Qai Gordon ‘18, Information Technology Management. Qai will be working at Wellington as an IT Analyst for the Asset Management division. Sarah Graney ‘18, Chemical Engineering. Sarah will be working as an investment banker for Goldman Sachs. Kelly Loughran ‘18, Finance and European Studies. Kelly will be working as a regional associate for Putnam in their Sales and Marketing division. Kelly Fischer ‘18, Finance. Kelly will be working at J.P. Morgan in the Sales and Marketing division. Q: Can you please start by explaining your role in the company where you will be interning this summer or working post-graduation? Andrew: I interned at Vanguard for eight weeks last summer in the Portfolio Review division, where I gained an exposure to a variety of projects. After graduation, I am returning to Vanguard to work in the Investment Management Development Program, which is a two-year rotational program. During this time, I will be primarily helping manage funds for our clients. Danny: I will be interning at J.P. Morgan this summer in the Wealth Management division. This division mainly works with high-net worth individuals and families, along with working with trusts. My typical work day will consist of making books that show how clients’ investments are performing in the market, and researching the market for prospective clients. Qai: As an IT Analyst for Wellington, I will serve as a liaison between the IT division and the business sector. I will have to understand the front and back end of trading. Sarah: I will be working in investment banking at Goldman Sachs, primarily working with corporate clients and the derivatives side. I will handle sales, be involved with checks and balances, and be responsible for synthesizing a lot of information and putting it all together in a concise way for clients. If you land this type of role as an intern, you won’t be able to trade so instead you will be put in a rotation and learn from different people and positions in the office. Kelly L: I will be a regional associate for Putnam, working on a team with investment specialists and other regional managers. My training program will consist of passing a series of tests in order to become financially regulated. After this training, I will be working with clients, primarily assisting financial advisors in managing their risks and returns. Kelly F: This past summer, I interned at Bank of America, but I will be working at J.P. Morgan in New York this summer. I will be in the Sales & Marketing division, working with the market to understand fixed income, bonds, derivatives, stocks, etc. Q: Can you explain why you chose to pursue the fields that you did? Andrew: I have always been interested in finance but knew that I didn’t want to pursue a career in investment banking. I decided to major in economics and look into investment management because I could apply my economics background more directly in that field. When I was applying to firms, I made an effort to connect with recent ND grads and network with them. Qai: I originally learned a lot about finance through Jumpstart Advisory Group, a company that helps unlock the full potential of young professionals and create long-term success by connecting employers with exceptionally qualified diverse candidates. There, I met a recruiter from Wellington. I decided to reach out to the same Wellington recruiter again a few years later, and to my surprise, he remembered me. This connection led to my summer internship and eventually my job. Sarah: As an engineer, I knew that I wanted to use my technical knowledge in the finance industry. I started going to recruiting events as an underclassman and networked with engineers working in investment banking. Firms are realizing the importance of diversifying their work cohort and are hiring people from different background. Goldman Sachs has a robust training program that gets everyone on the same page. Q: Can you offer some advice on the recruiting process? Danny: I think it’s important that all students leverage the Notre Dame network. So many alumni are eager to help students find jobs and internships and prepare them for interviews. I would recommend that everyone makes it their goal to network as much as possible. Kelly L: It’s essential to be proactive, especially with the accelerated finance recruiting process. You can be proactive by going to recruiting events, learning about the finance industry on your own, networking, and so forth. Amidst all of this, it’s extremely important to stay positive and understand that everything happens for a reason. Kelly F: In addition to taking advantage of the Notre Dame alumni network, I recommend reaching out to the upperclassmen still on campus. They are very willing to answer any questions you may have about internships, classes, etc. I also think it’s important to apply to things that you think you’ll enjoy. Don’t silo yourself to one specific field. There’s no harm in learning more about the different opportunities in the financial services industry. Q: What did your interview process look like and how did you prepare for it? Andrew: My interview process with Vanguard was not very technical since Vanguard hires people from diverse backgrounds. My first interview was a phone interview with behavioral questions. The second round was a super day, where Vanguard flew me to Philadelphia and I had the chance to tour the firm, have lunch with professionals, and have a few more interviews, which included a small case study. Sarah: My hirevue consisted of questions with two-minute answers. These questions were all qualitative, so practice talking about things outside of finance. After the hirevue, I had my super day, where I participated in back-to-back interviews. I only had one technical interview throughout the whole process. These banks want to ask qualitative questions because these questions allow you to stand out. Kelly L: My first interview was also a phone call interview, followed by a two-hour skype interview, which then led to my super day. The super day was mostly behavioral because they wanted to see if I would be a good fit for the company. When you go into interviews, I suggest that you ask questions, since you’re also trying to figure out whether or not the company’s culture is a good fit for you. Q: Is there any specific advice you would like to share with the underclassmen? many connections and experiences that can help with your career discernment. Also, make sure to keep up with them and thank them for their help after you graduate. Danny: Utilize the Notre Dame network. Not only are there amazing alumni willing to help you, but there are plenty of juniors and seniors that want to help underclassmen in any capacity. Also, don’t let recruiting intimidate you. Be yourself in interviews and know that everything will work out in the end. Kelly F: Don’t worry about filling your resume. Whatever you do, be invested in activities and programs that you enjoy participating in. Through student-led events like the SIBC panel, underclassmen are able to gain a greater understanding of the variety of careers and opportunities available for them in the finance industry and on campus.